Here’s a twist. Imagine a child teaching an adult? Well, it’s being done right here in the Albany area where the kids’ Sled Warriors ice hockey team is holding a teaching clinic for adults. The twist, you see, is this: the adults are disabled war veterans. 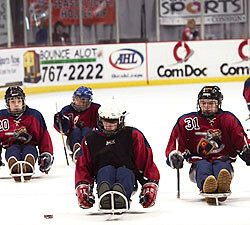 Their teachers are youngsters who are athletic, strong-willed, courageous and determined – and physically challenged. It’s all part of the Stride Adaptive Sports program, a fairly new therapeutic recreation-related service for individuals with disabilities that spans many Northeastern states, including New Jersey. In short, I am irked that right when I am most willing to Do Something, I am drowned in ableist pleas to Do Something that I cannot do. I am doing what I can – my art, blogging, participating in discussions when and where my spoons permit – but in the face of those endless pleas for phone calls, personal appearances, and donations, my best attempts are framed as pathetic excuses for avoiding “real” activism. The National Commission, Persons with Disability, said today that complaints about lack of accessibility increased by 76 per cent last year compared to previous years. […] Mr Camilleri attributed the increase in complaints to the fact that people with disability were becoming more aware of their rights. An area of concern, he said, was that despite the commission vetting building development plans submitted to Mepa, several new buildings still did not provide for access for persons with disability, meaning that the buildings were not built according to the approved plans. Ryan’s mother offered to walk him through the detector after they removed the braces, which are custom-made of metal and hardened plastic. No, the screener replied. The boy had to walk on his own. The article looks at how using captions in a family setting from a young age promotes positive attitudes towards captions. Ensuring that all content viewed in the family home and at school is captioned helps normalise a child’s experience. Griswold also encourages the hearing impaired child to take ownership and become the ‘technology expert’ for switching captions on. Ministers should act immediately to ensure that the use of full-body scanners at British airports is lawful, the ­Equalities and Human Rights Commission has warned. The commission’s head, Trevor Phillips, told the transport secretary, Lord Adonis, ­serious concerns existed about invasion of privacy and there was an apparent lack of safeguards to ensure scanners were operated fairly and without discrimination. Dr. Todd Zorick, a psychiatrist and professor at UCLA’s Semel Institute, calls the condition “Hollywood Not Otherwise Specified,” or Hollywood NOS. The unofficial term is a wry reference to the “NOS” designation in the Diagnostic and Statistical Manual of Mental Disorders, the bible of psychiatric ailments, which refers to a condition that impairs a patient but doesn’t fit with any specified, recognized disorder. Hollywood NOS describes a negative pattern of behavior for the sole purpose of achieving validation. The patients usually display a combination of symptoms: impulsiveness, anxiety, poor self-esteem and some personality disorder traits.